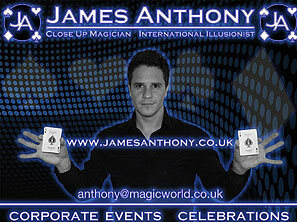 James Anthony is your NO.1 choice for magical entertainment for your next event or celebration, and is well known as the Manchester Magician. His unique style has earned him regular performances with companies such as: Ford, British Airways, Virgin, BBC, as well as many television appearances including Take Me Out series 2, and Let Me Entertain You with Brian Conley. Both can be viewed Here. Hi subtly mixes his magic, illusions, and sometimes suggestion and hypnosis to create a truly memorable experience for YEARS TO COME. Specialising in sleight of hand card magic, mentalism, and stage performances you can be guaranteed a quality of service and entertainment second to none. His performance style is also ideal for corporate events and specialises in mixing in your brand message into his magical presentations to leave your clients with a brand memory to remember. 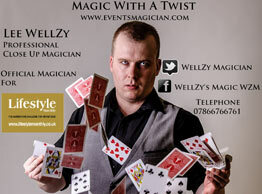 WellZy is a professional Close Up Magician that specialises in performing for the more grown up audience. In recent years he has quickly become the North Wests favourite and busiest Magician in the corporate and private sector. WellZy also works all over the UK and has even performed abroad in Florida for several restaurants on International Drive. WellZy has made performing to his spectators an art from and always leaves his spectators wanting more. His non-cheesy dedicated approach is what has made him so popular. He specialises in performing with cards, coins, metal bending, fire and magic not for the feint hearted including razor blade eating, cutting a signed coin from his arm, hammering a nail through his head, pulling thread from his tear duct, spike under cups and his very own nail gun Russian roulette effect. His magic is truly visual and stunning and will leave people wondering for weeks on end and they will also be left with some very unique souvenirs. 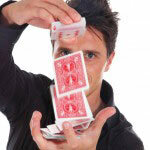 The magic that he performs is absolutely perfect for any special event whether it is adding some more magic to your wedding day, christening party, corporate function, Halloween party and 18th or 21st birthday. Recently WellZy has been made the official events magician for Lifestyle Monthly Magazine which includes Liverpool Fashion Week and the Lifestyle Awards. WellZy has had the pleasure of performing to some of the biggest names it television, film and sports including the cast of Peep Show / Phoenix Nights / Holyoaks / Players from Liverpool and Everton Football Clubs / The late Boxing Legend Smokin Jo Frazier / The International Tennis Tournament 2011 & 2012. The professional birthday party entertainment comedy magic, balloon animals and crazy clown antics with a mini disco and fun games, high energy routines designed for children aged 5 to 9 years. entertainment across the North West in Lancashire, Cheshire, Manchester, Warrington, Lymm, Knutsford, Bolton, Blackburn and Preston. The ultimate birthday party entertainment combining comedy magic, balloon animals and clown antics with a fresh vibrant, high energy approach designed for children aged 5 to 8 years. Now located in Cheshire and providing top class magic children’s entertainment across the North West in Lancashire, Cheshire, Manchester, Warrington, Lymm, Knutsford, Blackpool, Bolton, Blackburn and Preston. Nick Rushton has become one of the most popular and successful magicians in the country. Since winning the prestigious Magic Circle “Young Magician Of The Year” award, he has been booked to perform his unique style of amazing magic at private parties, weddings and corporate events all across the U.K.
Rather than performing on stage, Nick specializes in close-up magic. 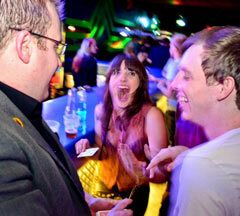 Close-up magic offers so much flexibility that it can be performed virtually anytime anywhere. It’s a new experience for most – seeing mind-blowing illusions being performed under their noses in such impossible conditions. Nick has also performed his award-winning Close-Up Magic on T.V. Frederic has performed at over 2000 functions for many prestigious private and corporate clients. He has entertained members of the British Royal Family, and many stars from the screen and the sporting world. His experience as a close-up magician will certainly contribute to the success of your next event. Numerous audiences have described him as a very slick and charming conjuror. His professionalism and unassuming manners have made him a very popular choice at various events. Frederic Sharp per forms at exhibitions, corporate events, dinner parties, weddings, garden parties, and much more…. With over 30 years experience, Cliff Cowling - Perception Deceptionist, adds that extra magic to any Function. Performing throughout the North West, his blend of Close Up Magic, Wit and Charm, has the spectators engrossed in the entertainment but with out it over taking the event. But if you want something really different for a Wedding, why not book Cliff as his alter ego Charlie Brush, the country's only Magical Chimney Sweep. After posing with the Bride & Groom, he mixes with the guests entertaining them with mind blowing Close Up Magic before the meal. A great novelty and a totally unique feature for any wedding. Multiple award winner with extensive performing C.V. Stage ,cabaret and close up performer on a Semi-pro basis. Stage & cabaret signature is Bullet Catch as well as many other dangerous feats. Mentalism a speciality. Creator of many marketed effects, inventor ,writer and all round know it all in the field of magic . At home in front of an audience of 10 people, to performing on a stage in a room full of hundreds, Matt will entertain your guests with amazing sleight of hand magic and some deft pickpocketing skills (Matt has possibly the fastest watch-steal on the planet, and a unique method of stealing someone’s tie - an unusual combination for a graduate in Law, with an MBA). And - he’s guaranteed to get your guests laughing as he does it. Incidentally, Matt has the rare accolade of probably being the only person to have ever pickpocketed a member of The Royal Family, and kept his head… for now. Matt has appeared on TV in the UK and abroad, performed for Royalty, celebrities and top businessmen (including Sir Richard Branson, Sir Alex Fergusson, Tim Henman, Tess Daly, Chris Moyles, the Getty family etc. ), been flown to events in Qatar, Hong Kong, Turkey, Monte Carlo, Berlin etc., entertained aboard cruise ships and at the famous Magic Circle, and he has promoted companies at Exhibitions throughout Europe. Matt has been the resident magician at Manchester United since 2000. 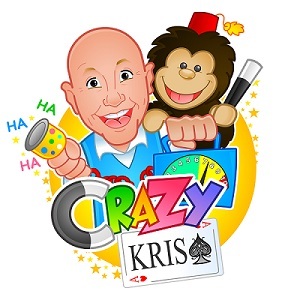 Amazing Stephen is an award winning magician and children's entertainer from Stockport, Cheshire. Near Manchester in the North West. He offers a one-hour magic show, or the two-hour magic and disco games party package. The comedy magic show is adapted for the children's ages and includes puppets, balloon modelling and lots of participation from the audience. His close-up magic includes fork bending, card sleights, ring manipulation and other amazing tricks. Andrew Normansell, entertains, leaving you with a lasting experience to remember ! Manchester children's entertainer MAGIC PHILIP guarantees to put a smile on children's faces of all ages with his action packed show full of colourful comedy magic, Fluffy the puppet rabbit, balloon modelling & audience participation. Philip will also host the whole party, adding special non-elimination games & can even offer take home balloon sculpture presents. Telephone 07970 871544 / Manchester 0161 448 2672 to check availability for your party. I have performed at Weddings, Events & Corporate Events for several years and have been a close up magician for over 20 years. I am happy to meet you prior to your event and demonstrate my abilities and wow you! I can travel all over the North West of England and any prices quoted all include travel expenses. I will help your wedding, special event or corporate function be one to remember!